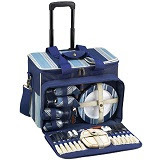 Capture the great tradition of a classic picnic, enjoyed with refinement and served in style. 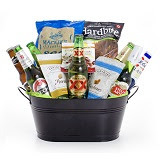 Fire up the fun with seven imported beers with our beer basket. 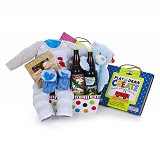 The perfect gift to celebrate a new addition to the family. 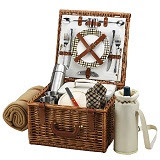 The quality and sophistication of the English style Cheshire Picnic Basket for two is sure to impress. 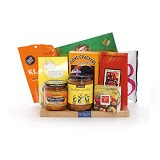 Indulge them with a gift basket made of gourmet foods. Two years ago, due to a back injury, I had to take a sabbatical from my activity with the Rotary Club of Vancouver. I kept my membership but was unable to participate or be as involved as I had been. I did go to attend funerals and for very special celebrations like the Outgoing President’s Ball last month.I quickly realized how much I missed the Club, the fellowship and the Rotary friends that I had made over 6 years. I decided to return, and in early June, I attended my first Rotary luncheon in two years – and it was delightfully nostalgic. I didn’t know until I was there how much I had missed the traditions of the Club, like starting every lunch meeting with O Canada and singingHappy Birthday to a fellow Rotarian. It is so inspiring to be surrounded by amazing, kind and giving people who do so much good for others – who put service above self. One thing that always impresses me about Rotary is the family connections. My first meeting back, I listened to the son of a fellow Rotarian thank the club for sponsoring his trip to Ottawa for Adventures in Citizenship. He shared his experiences, including what he had learned about Parliament and his pride as a witness to the citizenship ceremony. As an immigrant myself, it was particularly touching to hear how he felt when greeting my new Canadian brothers and sisters. I was also fortunate that the meeting I attended included presenting a member of our Club with a Paul Harris Fellow Award, the highest honour a club can bestow on person, regardless of their affiliation with Rotary. The recipient’s speech was moving, especially his heartfelt passion for the good that Rotary does and his vision of growth. And again, a family connection – my mother was a Paul Harris Fellow. It was a perfect homecoming for me, in many ways. I am committed to giving back to my community. It’s crucial to recognize the help we receive from others and pass it forward. This is the premise behind Abundance in a Box© and what I strive for both in my life and through my business. If you follow Green & Green on Twitter or Facebook, you may have already seen what we are doing to support Rotary this month. My husband is riding in the 30th annual Rotary Bike-a-thon this July 13th from Burnaby to Harrison Hot Springs in support of the RHF Hearing Foundation. I encourage you help by donating, or even to join our team for a great day on the road. We’re training together by biking to our favourite places in Vancouver – it’s a great way to explore the city and enjoy the sunshine!